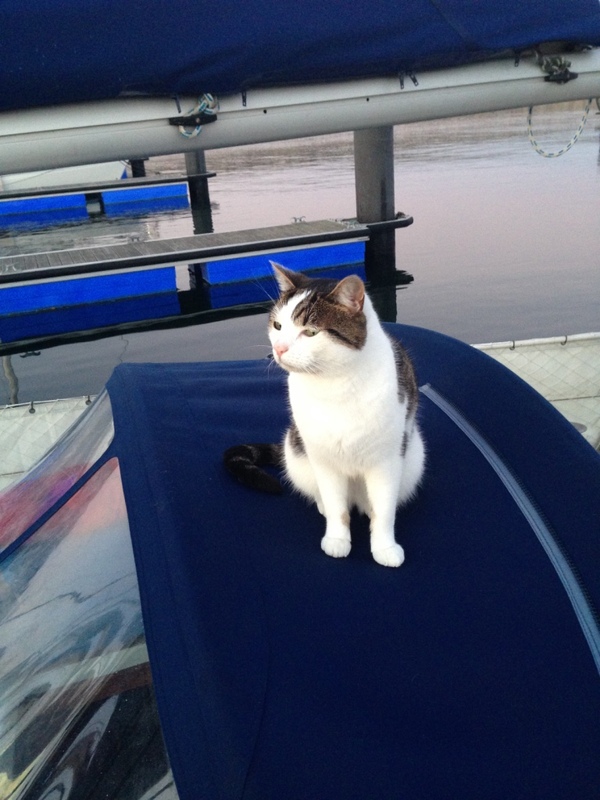 Well, obviously I am the ship’s cat – everyone knows about ship’s cats! – and thus I am in charge. I was originally an inner city tower block kitty. I don’t doubt I was adored, because I’m so cute, but I was kept shut in one room (I heard them mention ‘allergies’, though I’m not sure who he was and why he’d make them stay away from me), and I did have a dreadful case of fleas which was a bit embarrassing – especially being white, as they were quite obvious as they crawled all over me. That said, I had a litter tray and plenty to eat, I could keep myself clean and handsome; captivity could have been worse I suppose. One day when I was about 8 months old, I was taken out of the tower block and put in a cage in a car – bit weird, but I went with it because I’m a cosmopolitan sort of cat-o’-the-world. I was taken to a different place, some nasty liquid was put on my neck – I couldn’t even get to it to clean it off, and I was put in a rather sparse room for a day or so (I spent it hidden behind the sofa anyway). Then everything was sprayed – whatever that was about, the fleas didn’t seem to like it as they all left (I’d become bizarrely used to them, but it was a bit of a relief when the itching stopped), and I was then allowed to roam free in this new place. My idiot minder trying to strangle me to achieve internet hilarity. At first it was a bit weird – there was a mountain in the house that you had to climb, never seen on of those before, but I discovered that it led to an amazingly comfy bed, and also a room with two separate taps to drink from! Not as good as the downstairs one near where all the food is that I always trying to drink from (until I get spotted – dunno why folks don’t like that). Then I got let outside – my first time! The grass was pretty good, as was digging up the veg patch, but it took me a while to get used to balancing on the fences. And I hadn’t seen another cat, or been in a fight before; I’m a bit ashamed to admit that I got a couple of kickings (they were so aggressive – definite anger-management issues! ), but I soon toughened up, and I’d see off any cats trying to get a look in on MY territory! My facilitators, as I call them, are acceptable. There is always plenty food available – though this varies in quality to be honest. The way they act, you’d think that bits of chicken and bacon were like special treats rather than the level of food to which I should have become accustomed in my life, but I play along and act all excited anyway. If I’m honest, I am quite excited as it is certainly better than the dry pellets I often am forced to subsist on. I get on pretty well with this life. I mean, humans are humans aren’t they? You just need to play the game. I’m not all stuck up like some Toms you get. I don’t even mind the odd chin-tickle (on my terms though, obviously). Then came the second big move of my life! Back in the cage. My cage experiences haven’t been great – stuck in the back of a car usually, and once even taken for an operation of extreme prejudice against my manhood! We turned up at this new place, all tiny with no garden, and a bit unstable – luckily my balance was amazing by that point. I decided not to hide behind the sofa this time (well, I tried, but you can’t get behind anything in this place! ), so had a good few days to explore. They kept expecting me to wee everywhere – what kind of cat did they think I was?! – but it was all quite comfy and I made myself at home fairly quickly. Even that scaly reptile from the Ealing pad was here, so I had a nice warm spot to sleep on until I took my rightful place on the bed. Or pretty much anywhere else I fancied. It was all going pretty well, until one day the ‘thunder’ started – it wasn’t like any normal thunder I’d heard before – it smelt kind of like when we stopped in the car once and they put a hose in a door in the back – the noise was so loud that it made the whole world vibrate! Terrified, I hid in the bed and waited for the end, but it passed over fairly quickly. I gradually got used to these ‘thunderstorms’ and just curled up and went to sleep. Often I got a pouch of wet food to distract me, which was quite nice. Then one day it got weirder. The normal thunderstorm at first, loud, vibrations etc but then my balance totally went, I was all over the place – everything was moving, stuff was falling and sliding everywhere. I was sliding everywhere too – just trying to walk a yard on a flat floor had me slamming into cupboards. I couldn’t work it out. Nowhere was safe! There was no wet food today; those two were outside doing something – it all seemed a bit hectic. They looked quite wet so I wanted no part of it. Although in fact everything inside was wet too, but salty. Every now and again I think they were throwing a bucket of sea water into the cabin just to scare me more – still, I giggled a bit when I saw the iPad and phone crashing onto the floor. I like to think I’m a courageous type, but this was purely terrifying – I found myself a cupboard space and wedged myself in as best I could. It went on for hours. And hours. Then finally it seemed to improve, the crashing stopped, the sliding lessened. I wasn’t to be fooled though, I was staying in my cupboard until the thunder stopped. It eventually did, but I stayed in another couple of hours just in case. When I emerged it was like a tsunami aftermath. A lot of broken stuff, a lot of wet stuff, and the humans looking shell-shocked and quaffing down some kind of drink from a large bottle that had made a funny ‘pop’ sound when they opened it. The scaly beast just looked at me like ‘whassup?’ As if nothing had happened – weirdo. A few months after that, a puppy arrived. We immediately looked at each other and made a tacit agreement just to try and get along ‘for the sake of the parents’, and sealed it with a touching of noses. It’s more or less worked, but she is so annoying sometimes; wanting to play while I want to ponder higher things. Sometimes I just have to hook her a good one-two like I learned in the Ealing ‘hood. That usually restores my authority. At least I think it does because I am a pacifist at heart, so I just turn tail and leave her to annoy the others. Now, of course, there’s another human on board. This one seems ok, though he’s a bit loud and smelly. He doesn’t bother me, doesn’t try and smell my bum, steal my food, or stop me sitting on the warm tank. But I don’t take this acceptance of my seniority for granted; I’ll be watching him. The thunder has happened since, and although I once ran off and refused to come back until it stopped, I have gradually accustomed myself to it. I have come to realise that these poor humans really have no clue either, so it is my duty to take control and help. When the thunder starts, I often pop outside and keep watch for them as we end up in all sorts of places – weird languages, weird local felines, weird warm weather and lots of sun that makes me wonderfully sleepy… The wet food has returned, and they appreciate my efforts so much that they even bought a spray hood to cover my lookout post, and a cushion so I’d be comfy. My contribution is certainly more use than the puppy’s – all that damn thing wants to do is smell my bottom and cuddle the humans. No help at all with important things like being on watch, or sitting on the chart (‘studying it’ so they don’t go off course etc). On watch. Guarding against all evils. Thank goodness I’m on board, that’s all I can say.